After a long wait post Lavasa Bike Ride, another was due. I remembered my old trek of Tringalwadi where we had a soulfull swim in the Tringalwadi dam. The date was set, 25 Feb 2012. We had a cold water swim on a super-hot sunny day in the Tringalwadi dam. On our return back, had our lunch around 1.15pm @ the Greenland restaurant near Igatpuri on NH3. The timing was more to protect ourselves from the heat. 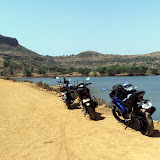 hello Ruturaj,those are some great photos of your bike ride to trigalwadi lake.I am Aniket shirkar from andheri east mumbai,i too was planning a motorcycle ride to tringalwadi dam/lake on 25th oct 2015. I wanted to know from you that is the tringalwadi lake/dam accessible through a 2 wheeler ? and can we enter into the waters of tringalwadi dam/lake? Yes the reservoir is accessible from a 2 wheeler. Id suggest to wait for Nov. Az its sweltering right now. However hotter it is sweeter is a dip in the water!! Yes you can enjoy ur time in that reservoir cooling off ! Thanks Ruturaj for the advise,wil have to make it the coming sunday,some of the riding buddies cant make it in november.But nonetheless,have the lake to energize us again. Have you been to the waters of Vaitarna Dam,ive heard one is forbidden to enter into the water,is that true? Hi, I haven’t been to Vaitarna. And yes it could be forbidden, since Mumbai receives water supply from that lake / dam, same is the case with other reservoirs like Modak Sagar, etc.